I did not soak my peas as instructed and they definitely suffered. The flavors were amazing though. Holy moly this was divine. 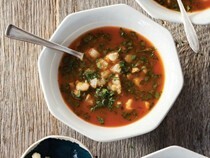 I used roasted vegetable stock, which was amazing with this. I also roasted some sweet potato alongside the tofu to give it a little extra oomph. It was exactly the perfect amount of spicy and peanutty. Though it took a while to make, I'll definitely make it again. This was a delicious and satisfying meal. The flavor of the curry sauce is rich, especially with the peanut butter. Like the reviewer below, I used chicken stock (what was on hand) but subbed chard for the mustard greens (again, on hand). Mustard greens would be better, but the chard was fine. I used half a jalapeño WITH seeds (the recipe calls for a whole jalapeño unseeded), and it wasn't nearly enough- next time I would definitely use the whole jalapeño because the sauce can really take some heat. Also, I wasn't careful in watching the tofu pieces crisp in the oven, so they dried out a tad too much. Just check them much earlier than called for in the recipe. I used chicken stock and didn't have any garlic powder. I also used dandelions greens instead mustard. It was good but next time I would use the mustard greens as they are heartier. Afro-vegan sounds so much more exciting than just plain...vegan. And considering that this dish got several good reviews, I decided to try it to use up a bag of mustard greens. My daughter and husband really enjoyed it. I thought it was fine but could be better: roasting the tofu for 30 min. made it rubbery--either roast half the time or not at all next time. I used an organic peanut butter, which may be more insipid than other brands--increase the amount to taste next time. I do like the idea of adding some sweet potato to this dish, and it would help fill it out so the three of us in our family could have leftovers the next night (seemed to serve 5 people instead of 6-8). I served this over basmati rice and with a citrus fruit salad. I was disappointed in this recipe mostly because the headnote calls it his favorite recipe in the whole book. I thought that would mean the relatively plain braised mustard greens would taste more special than the ingredients suggested, but it tasted just like greens cooked for a long time with a single clove of garlic and vegetable broth. The onions were okay, though obviously not caramelized in 15 minutes. The vinegar with serranos and black pepper (separate recipe) was good and lent some flavor to this bland dish. These were quite delicious. I had made the braised greens portion of the recipe back in November and frozen it during a greens glut at my CSA. So today, I reheated the greens and prepared the onions. I couldn't remember how many greens I used so prepared half of the onion mixture. (Once thawed, I would say I used maybe 1/4 to 1/3 of the required pound of greens.) This recipe continues the annoying fallacy that you can make caramelized onions in 15 minutes so I ignored that instruction and cooked until caramelized. I tweaked the recipe slIghtly by adding minced jalapeño to the onion mixture (a whole one unseeded) when I added the tomato paste, since I was using a frozen chile. I was heavy-handed with the onion topping, and it was exceedingly good with the greens, but I have a lot of onion left. I would definitely make the greens in advance and freeze them again. I thought these collards were excellent, some of the best I've made. They had a nice kick to them, but I would probably leave the seeds in the jalapeño next time. I had frozen and already blanched and chopped collards so just cooked them a little longer in the onion and spice mixture rather than the 10 minute pre-cook in salted water. I liked the technique of making and using cashew cream as a non-dairy alternative to make the grits creamy, but I don't think I blended the cashews sufficiently when making the cashew cream, which made it hard to tell when the grits were done. The grits were really just a foil to the excellent collards though, in my opinion. An interview with author Bryant Terry. 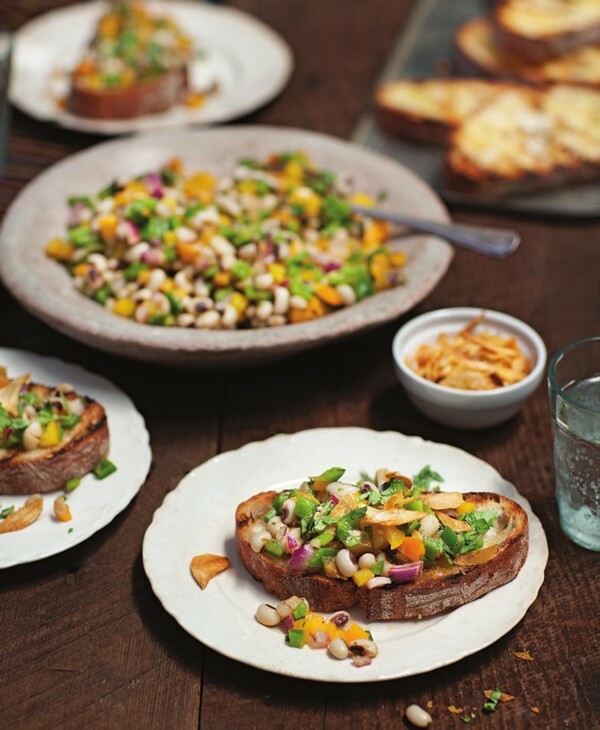 Terry's recipes are flavor- and culture-driven first, and vegan only as a matter of course. 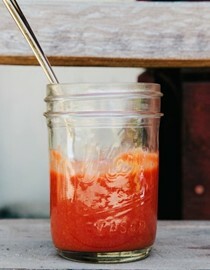 There are no apologies or tricks to cover up the flavor of the substitutions. It is amazing that such a simple broth...could be so flavorful. Be very careful when you fry the hominy. It will pop and splatter. Use the deepest saucepan you've got to help contain the oil. Consider me devoted to the combination of plantains and creole spice. It took me longer than 1 minute of frying for the plantains to brown and crisp. Plan for an extra minute or two. 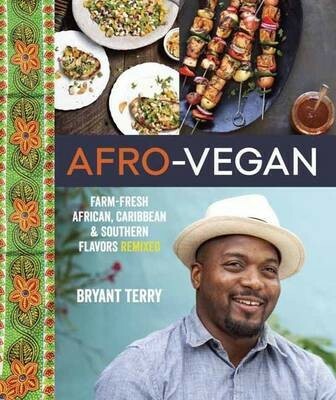 A groundbreaking cookbook from beloved chef-activist Bryant Terry, drawing from African, Afro-Caribbean, and Southern food to create over 100 enticing vegan dishes. Rising star chef and food activist Bryant Terry is known for his simple, creative, and delicious vegan dishes inspired by African American cooking. In this landmark cookbook, he remixes foods of the African diaspora to create exciting and approachable recipes such as Corn Maque Choux-Stuffed Jamaican Patties with Hot Pepper Sauce, Berebere-Spiced Black-Eyed Pea Sliders, Crispy Teff-Grit Cakes with Eggplant, Tomatoes, and Peanuts, and Groundnut Stew with Winter Vegetables and Cornmeal Dumplings. He also explores key African ingredients that are popular in Caribbean and Southern dishes—like okra—tracing their history and giving them cultural context. Afro-Vegan will delight Bryant Terry fans; vegans looking for exciting new recipes; cooks interested in African, Afro-Caribbean, and Southern cuisine; and health- and eco-conscious eaters.